For my last week in the US a friend and I were desperately trying to fit in a good Chinese before we left but kept not getting round to it. Eventually we managed to make it to Sīno on our last night. Don’t let appearances deceive you, from the front Sīno appears to be just a noisy bar, I think you can actually get a limited food menu in here, but the back of the bar opens up to quite a large restaurant space. The atmosphere from the bar leaks through and it’s a really lively buzzing space. There were loads of things I wanted to try on the menu and our waiter, Jason, was really helpful in recommending stand out, popular dishes. One thing to note about American restaurants, in fact everywhere from restaurants to gas stations to coffee shops, is that the service is excellent. Waiting staff are always friendly, accommodating and know their menus inside out. Unfortunately this kind of service is a notable exception in the UK. We chose to eat ‘family style’ which in English means we ordered several dishes to share. From the appetisers section we chose the salt and pepper shrimp (prawns) and crab cakes. 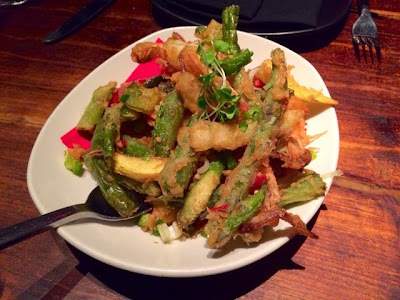 Salt and pepper shrimp came deep fried with a great selection of deep fried vegetables. This was really delicious, the batter was really nicely seasoned giving everything a great flavour without being overly salty and a really light coating kept everything from being too stodgy. The prawns were really big and juicy too, they were really meaty and plenty of them. 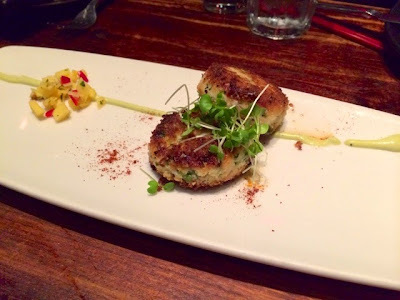 Crab cakes were served with a mango relish and aioli. The crab cakes on their own were fantastic, really moist and packed with flavour but when you combined a mouthful of crab cake with a little bit of the aioli and a few pieces of mango the dish really came into its own. Well balanced flavours that complimented each other perfectly. My only complaint is that there were only two on the plate! I could have easily squeezed in a few more. 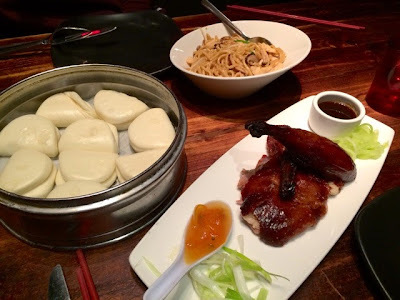 We followed this up with a proper Chinese restaurant classic: half a peking duck. Unlike the pancakes we’re used to here in the UK it came served with these delightfully adorable steamed buns. The buns were surprisingly light and for me a really novel new way of having this classic dish. The usual trimmings of shredded cucumber and spring onions were served alongside a hoisin sauce. The duck didn’t quite fall apart as I expected it to, we had to cut it into small chunks to fit into our buns. It would have been nice if it shredded apart, however the skin was really crispy and delicious. 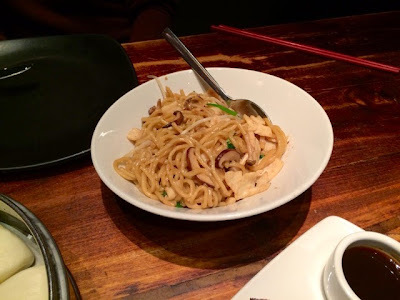 We had a side of garlic noodles with our duck and which had a good strong flavour without being too overpowering. With succulent pieces of chicken and meaty mushrooms scattered throughout this bowl of silky noodles went down a treat. I really didn’t know what to expect from Sīno, but overall I’d have to say it was easily one of the best meals I ate on my trip to California. Each dish individually stood out and I wouldn’t describe any of them as average. Our appetisers specifically were particularly enjoyable. If you’re in San Jose I’d highly recommend this restaurant for a great atmosphere as well as delicious food.